PNG can be considered to be the upcoming rising star as a mining destination of the 21st century. It is a resources rich nation, soon to be able to get into the ranks of Australia and Chile. OZ Mineral’s Prominent Hill mine has a remaining 8 year mine-life from now, with latest reserves (as at Jun 2010) of 5.5 billion pounds of copper (1.135 billion pounds Measured, 2.43 billion pounds Indicated, 1.88 billion pounds Inferred) and 3.1 million ounces of gold (0.5Moz Measured, 1.4Moz Indicated, 1.2Moz inferred). Refer tohttp://www.asx.com.au/asxpdf/20101109/pdf/31trr9pnqgpjlc.pdf . Assuming copper price of US$4/lb and gold of US$1300/oz, that means OZ Minerals has $22B of copper and $4B of gold, a total of US$26B of resources (Measured+Indicated+Inferred). 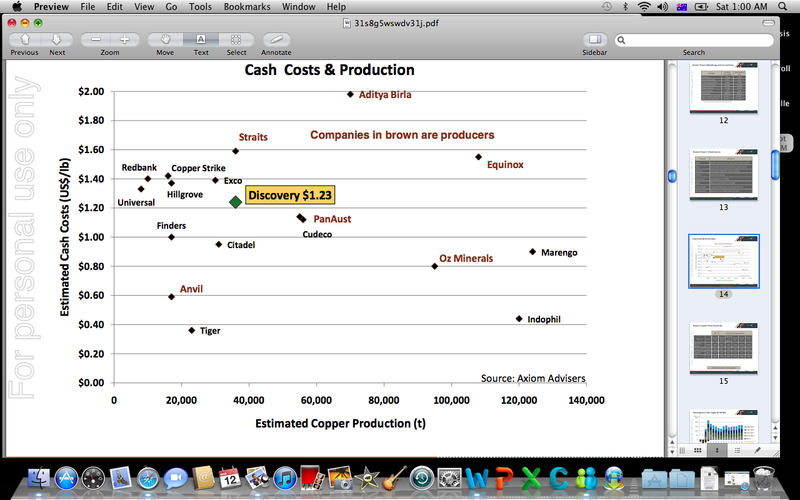 Comparing MGO’s resources with OZL’s resources (refer to http://asx.com.au/asxpdf/20110228/pdf/41x36stqj3wspq.pdf) , MGO currently has 6.5 billion pounds of copper (1 billion pounds measured, 1.9 billion pounds indicated, 3.6 billion pounds Inferred). Assume same copper price of US$4/lb, it has a whopping US$26B worth of COPPER!! In addition, MGO has a total of 204M pounds of Molydenum (45M pounds Measured, 68M pounds Indicated, 91M pounds Inferred). Molydenum is a material used to manufacture high corrosion-resistance stainless steel (e.g. super duplex steel). Assume price of Molydenum of US$20/lb, this means MGO has US$4B worth of Molydenum!! This brings it to a total of US$30B worth of resource!!! MGO’s resource can be even bigger than OZL!! Doing a sensitivity analysis, you may say that that’s just a lot of inferred category stuff in MGO’s resource statement. If the inferred category is taken out and a comparison is made, OZL should have US$14.3B of copper and US$2.47B of gold, which brings to a total of $16.8B. MGO should have US$11.6B of copper and $2.26B of Molydenum, that brings it to US$13.8B. Basically, the message is, MGO would be in the comparable league of OZL category of companies! Now, current market capital of OZL is A$4.81B with 3.24B shares issued. However, MGO’s current market capital is only A$273.36M. OZL’s mkt cap is now 17 times greater than MGO. However, both companies have almost the same amount of resources. Risk is proportionate to returns: the higher the risk, the bigger the returns. But the higher the risks, the bigger the discount to the share price too. If there’s a huge discount to the share price due to inherent risks of the share, then, we ought to ask: What are the risks that MGO have? Risk of getting the money to fund the capital cost to build the plant is low with China NonFerrous Metal Industry’s Foreign Engineering and Construction Co. Ltd (“NFC”) offering to provide at least 70% of the capital cost or help MGO connect with Chinese banks to lend their capital. If 70% of the funding is obtained via a Chinese bank debt, that means NFC has to fund it by equity issue of US$480M. With current share price, it needs to issue up to 1.8 billion shares – making it similar to OZL’s # of issued shares. But of course, the better option is to fund it all entirely with debt and pay it off. However, it is quite likely that NFC would try as much as possible to negotiate a higher % of equity stake in MGO. Risk of cost blow-out: Low, due to the arrangement of a lump sum EPC Project with NFC. In a lump-sum project environment, the real exposure is to claims lodged by the EPC Contractor against the company. However, with the partnering arrangement in place, this risk is minimized. The Chinese would not want to risk a backlash by Australian company when they are the ones needing the resource, and they wouldn't want to sink a company which they themselves have a huge stake in (when they participate in the equity offering and arrangement of bank debt). US$1.6B capital cost is needed to get the plant to 25M tonnes/year production. Geological Risk: Low. PNG is a geologically active area (lots of earthquakes). However, this risk is low considering that there are so many major companies which are already investing into PNG on the same main island, e.g. ExxonMobil. If ExxonMobil (very conservative oil company) is comfortable with the risk, I think we should be quite comfortable with it too. Environmental Risk: Medium. This is the only risk that could be a bigger challenge for the company. The possible ways for MGO to manage the mining tailings is to build a dam, use DSTP (Deep Sea Tailings Placement) similar to Ramu Cobalt-Nickel Mine and Lihir Projects, or to build a processing plant to treat the wastes. The PNG govt is quite likely not to have a huge appetite to build a dam to contain the mining waste as OK Tedi’s dam was damaged in an earthquake back in 1984, which was a factor contributing to OK Tedi dumping mining wastes straight into the river systems leading to a huge environmental disaster. Having a potential damage by earthquake of a dam, and end up releasing tonnes and tonnes of toxic wastes into the environment would be quite unacceptable. Possibly, the DSTP method may work for MGO. Product Sales Risk : Low. NFC has already offered to off-take a portion of the product from the Yandera project as part of the MOU signed with NFC. MGO has already secured a big customer!! And with the rising world demand for copper (China being a big driver of this demand), there shouldn't be any concerns on whether they could sell the product. Political/Sovereign Risk: Low. MGO has very good political connections. It has the former PNG Mining Minister (Samuel Akoitai) and the former PNG PRIME MINISTER (Sir Rabbie Namaliu) within its board of directors!! These men would be able to help MGO in navigating to get the mining licenses/leases renewed and to assist in getting the environmental approvals required. Construction Risk: Low. With NFC successfully constructing the nearby Ramu Cobalt-Nickel mine, NFC should have the capability to construct and deliver the project in PNG on time for a early 2014 start-up. Resource Upgrade Likelihood: High. MGO still has $71M in cash as of 31 Dec 2010. This money is enough for it to continue its drilling program around the resource and prove more of the inferred resource into the indicated category. As drilling continues, the company shall keep on adding value to the company. When good news is released on any upgrade in the resource, this will drive the share price even higher. Even if the capital cost of that plant is US$2.5B (assuming another extra US$900M to deal with the mining tailings), the NPV for the project will lead us to $1.76/share. This is not taking into account that the company will find and prove more reserves with its continuous drilling program. § MGO has recently issued 110M shares (fully subscribed) at a price of C$0.25/share (which is about A$0.255/share) to institutional investors. This helps set a floor price. Major institutional investors will generally not allow the share price to go below the price for which they’ve obtained the shares. § Share price has a huge potential to spike up as soon as Definitive Feasibility Study (DFS) is released (targeted for 1Q’11). It’s now getting to mid-March, so the DFS report is not far away (in the next 2 weeks). Quantum Partners is a fund owned by George Soros. George Soros is a man who knows how to profit from financial crises. He still managed to earn $1.1 billion while the rest of the investment companies were reeling from the recent 2007/08 GFC. 3rd biggest shareholder: OMERS (Ontario Municipal Employees Retirement System) – 6.1%. Supposedly, a retirement fund usually should be quite risk-averse. This gives us another comfort factor that the risk of investing in this company is low. From market capitalization comparison, MGO will soon become another OZL with market cap in the order of $3B. This would mean that MGO will have to be $3/share to be a $3B market cap company with current # of shares issued. Assuming that 3B shares have been issued then, it has to be at least $1/share for it to be a $3B Market Cap company. From DCF analysis, MGO will also be $1.76-$2.67/share provided that all risks mentioned above are managed properly. From PE Ratio analysis, at 25M tonnes/year production, MGO will generate a net profit in the order of US$600M per year! Assuming a 3 billion issued shares (similar to OZL now), and at the price of $2.00/share for MGO, the PE ratio will just be 10. When it ramps up to 50M tonnes/year production, the PE ratio will just be 5! Hence, MGO share price will be able to go up to at least to $1.00/share in 1.5-2 years time (very conservative estimate). This is not taking into account all the upsides that MGO has by its continuous drilling program in the 1900km2 tenement that it has in PNG. 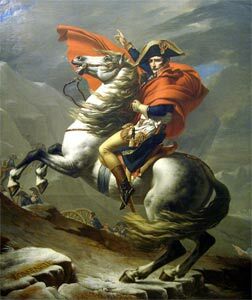 Note: Marengo is Napolean’s favourite horse who had faithfully served him for 35 years. I’m sure MGO will also faithfully serve those of you who’re willing to buy a stake into it!! 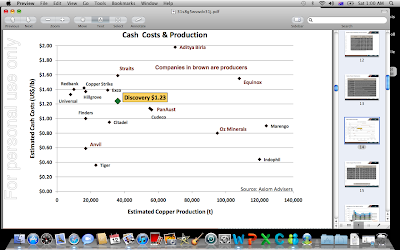 You can see that Marengo is forecasted to be one of the lowest cost producers of copper (on a per lb basis), almost next to OZ Minerals. Disclosure: The analyst is a long-term shareholder of MGO. This share analysis does not represent an investment advisory service as no subscription or management fees are charged. The contents of the article are provided as general information only and should not be taken as investment advice or as a recommendation to buy or sell any security or financial instrument. Any investment decisions carried out based on information, analysis, or commentary provided here is solely your responsibility. You should consult your investment adviser before making any investment decisions.